Those of you who have been reading this blog for a while know that I’m a big fan of cashew cheese. It has found its way into countless lunchbowls, salads, pasta and grain dishes, collard wraps, and other recipes since I started blogging, and it remains one of my favorite ways to add flavor to dishes. 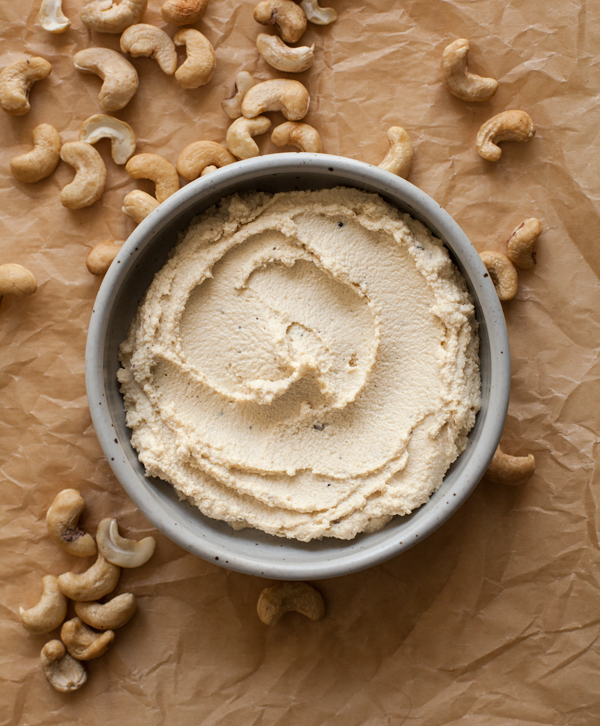 When I mention cashew cheese to clients, it often tends to evoke raised eyebrows, or the quick disqualification of “oh, that sounds like a lot of work.” But making cashew cheese at home is really as simple as making hummus or bean dip or any other number of condiments. Today, I’m sharing my go-to cashew cheese recipe, the one I return to again and again (along with a few flavor options). I hope you’ll come to rely on it as much as I do! There are different approaches to making cashew cheese. Some folks like to use a high speed blender; I find that you have to add a lot of liquid to make the cheese blend properly, which results in something that’s closer to cashew cheese sauce than cashew cheese (not that there’s anything wrong with a cashew sauce). So, I like to use my food processor, which creates a texture that falls someplace in between ricotta cheese and hummus. When I was working on Food52 Vegan, my editors asked me a few times what the perfect texture consistency for cashew cheese was. To some extent, this is a matter of preference–you might want to create a loose, creamy cashew cheese for folding into pasta, or you might prefer a really thick batch to crumble onto salads. 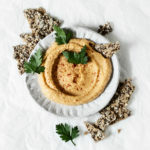 But for the most part, what you want to whip up in the food processor should resemble a thick batch of hummus: smooth, but with a bit of coarse texture. Once you prepare the basic recipe I’m sharing today, you can start to modify it by adding your favorite herbs (I like to pulse in dill, chives, thyme, and herbes de Provence), spices (extra garlic powder and even a pinch of curry add tons of flavor), or dried fruit (cranberries make a great addition, especially for a holiday appetizer). The cashew cheese will keep for about 5-6 days in an airtight container in the fridge, so you can savor it in meals all week long. Place the cashews, nutritional yeast, lemon juice, garlic powder, salt, and pepper in a food processor. Pulse repeatedly to break the cashews down, until they form a coarse, wet meal. Scrape the sides of the food processor down with a spatula. Turn the motor of the processor on. With the motor running, drizzle in the water and let the cashews process for about 10 seconds. Stop and scrape the machine down again. Continue processing for a full 1-2 minutes, or until the cashew cheese is smooth and thick, adding a tablespoon of extra water if needed. The consistency should be a little bit like hummus (see photos of finished cashew cheese as a cue). Taste the cashew cheese and add lemon, salt, and pepper to taste. If you like, pulse in fresh herbs or other flavorings. Serve. Cashew cheese will keep for up to 6 days in an airtight container in the fridge. 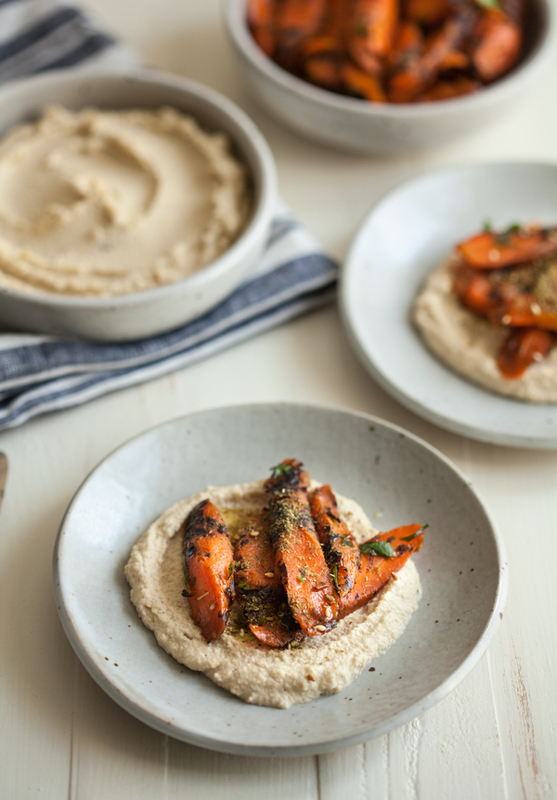 Here you can see one of my most recent favorite ways to serve cashew cheese: as a base for oven charred carrots and a sprinkle of za’atar. 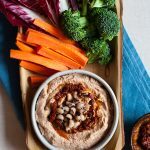 It’s a perfect nibble to serve friends at a gathering or before a dinner, and the contrast between sweet, tender carrots and tangy cashew cheese is really irresistible. Enjoy your cashew cheese adventures, everyone. I’ll be back tomorrow with a new green recovery post. I just made this 1st time using cashews ..wow so delicious ! That looks interesting … I’ll have to try it out this weekend! 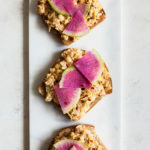 Great recipe, I love cashew cheese too! I also prefer to use the food processor, the texture and consistency is really much better that way. And those charred carrots, wow, beautiful presentation ♥︎ Pinned. Mm, finally a tasty option to change cheese with! Definitely going to try this! It looks and sounds like a dream. Yum! I love cashew cheese – I have no idea how I survived without it for all these years. Thanks for debunking the myths that it’s either difficult to make or just weird, it’s actually so much better than dairy cheeses. Even my meat & dairy loving fiancee enjoys cashew based creamy cheeses the most 🙂 Thanks for the mix-in tips! I love how versatile this recipe is – my favorite add-in is actually roasted garlic (we love that stuff). I wish more folks who have made this dish would comment. I’ve now made this twice based on the Healthy Librarian’s recommendation. It’s delicious! The flavors marry in a way that I could not predict reading the ingredient list. I wouldn’t call it “cheese” in the presence of non-vegans but it stands tall on its own merits as a spread or condiment. I love it as a spread on toasted bread and generously dolloped onto bowls of quinoa, beans, and veggies. Also good as a dip for crackers and pretzels but it seems like a waste to use it for this! I made it exactly as described except I used heaping tablespoons of unfortified nutritional yeast and heaping 1/4 tsp of black pepper. Everyone in our house loves it. I will make again and again! Thanks! Just want to update that we’ve now made this every week for the past 7 weeks and it’s as tasty as ever! Normally I’d be sick of a repeat dish by now but this one is just so versatile. My SO and I love it with salads as some might use goat cheese! Thanks! 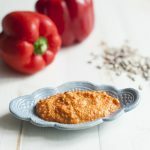 Can’t wait to try your sunflower seed romesco once we get some peppers! Oh, I’m so happy you like it! I pretty much make it on repeat, too. The romesco is delicious, too 🙂 Enjoy. 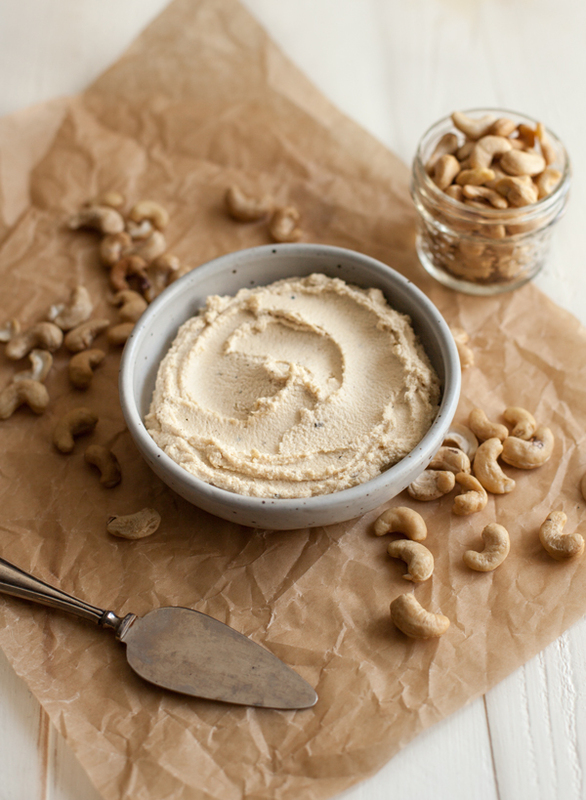 This is far and away my fav cashew cheese spread recipe. Most others use Dijon which is too vinegar-y. I used fresh pressed garlic and fresh lemon juice. Totally scrumptious. cashew cheese will always be my favorite! Thank you for sharing this recipe. I just made this and it’s wonderful. I have only a Vitamix, but I’m ok with the smooth texture. Thanks for a great recipe that I’m sure I’ll use over and over. Is this something that you think can be put on pizza? Maybe just dollops of it? If so, would you add it before cooking the pizza or after? Yes, I’ve tried it on pizza! You can add some dollops prior to cooking or after, but I prefer to add them prior, so that the cashew cheese becomes warm. Thanks! We make homemade pizza on Friday nights. Trying this tomorrow! This recipe is amazing OMG! I’m amazed! 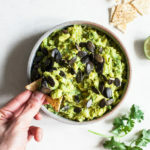 I’ve been a vegan for 2 months now, so I’ve been on the hunt for recipes that aren’t just “eh, that’s good for vegan food”, but that are actually good, for vegans and non-vegans. And this one definitely just earned a spot on my list. And to make it even better, it’s really easy to make! I’m not very experienced in the kitchen, but the recipe was very easy to follow and came out exactly as I expected from the pictures. And I was really glad that it actually had a very cheesy flavor, and I couldn’t taste the cashews at all. I don’t hate cashews, but I’m not a huge fan, but this is just perfect. Thank you so much! Will be making this regularly, my family also loved it! So happy that you like it, Daniela! Can it be made without nutritional yeast? Sorry, I’m in Australia. Big time difference. Go back to sleep if I woke you. Certainly! It’ll just taste slightly less “cheesy” and savory. I absolutely love cashew cheese. Thanks for the reminder. I tend to make things regularly for awhile and then get tired of them. I will try this next. I am addicted – the only problem is how to stop eating it! Thank you it is delicious! So very delicious!! It is hard not eating the whole thing in one sitting! So glad you enjoy it, Michelle! Since I don’t have a processor, so you think grinding in a coffee grinder & then using a blender will give it that smooth texture? I definitely wanna give this a try..
I’m really not sure — I’ve never tried a grinder. A blender might work on its own if you add enough water, though — and the cheese will thicken up in the fridge. Good luck! I made some using a blender. I put the blade attachment on a mason jar and blended the ingredients in the jar instead. It worked. Although I had to stop more often than I would if I had a food processor. I’m looking forward to making this recipe this week! Quick question – can this cheese be used in recipes that need to be baked (i.e. alongside sautéed veggies as an enchilada filling)? I only ask because when I’ve microwaved cashew cream before the texture has been ruined (hard and grainy), so I”m wondering if prolonged heat has a negative effect. I can always just dollop it on top afterwards, but vegan enchiladas might be an easier sell to my husband if there’s some creaminess inside 🙂 Thank you! I’ve had good luck spreading it on top of enchiladas and having it get a little browned in the oven — I haven’t had the hardness you mention, though it’s possible that the cheese gets a little more grainy. I think if you put it inside enchiladas and baked them you’d be in good shape, because the enchiladas would hold moisture in. I hope it works out! Did you use flake or powder nutritional yeast? I read somewhere that if flake is used, it requires more. There is a slight difference in weight, but for the most part I find that flake vs. powder quantities and measurements can be comparable in recipes. So, you can use either here. I don’t have a food processor. Only a Ninja blender. So it’s the high pace kind. Would an Immersion Blender work better? Actually I think a Ninja will work well for this recipe. I’ve made it in a high speed blender with good results. Hope you enjoy it! This is great Gena–a fantastic staple. I added a little bit more nutritional yeast. Next time I will add some fresh herbs. Yum! I absolutely love this recipe! I’ve made it two weeks in a row so far, and I put it on basically everything! I was just wondering if it freezes well? Thanks in advance! Just made this with my Vitamix with 1/4 cup of water as written. Well, after it was in the refrigerator it remained the same. Unlike the pictures you posted. You could add coconut or olive oil, sure. If you use a high speed blender, it will be even creamier, but I usually use a food processor because I find that it blends more readily. LOVE this recipe. I’ve made it every single week since I first tried it. So easy and I love it! I have it on toast and sprinkle a little cajun seasoning on top of, every morning! Absolutely wonderful! I love this recipe. I spread it on a toasted poppy bagel, and I add a toss of sprouts. Breakfast is served. I wonder why you say prep time 2 hours? It takes 10 mins to make and then leave to ferment for two hours b4 eating? I’ve also featured this in our website Green Thickies latest post 10 Delicious Raw Vegan Cheese Recipes. Not the actual recipe, but only one image from here, a small quote and I have credited to you and linked back to this page. I hope that is okay with you. Tried this today. It’s yummy! I made this cheese today and it’s really good! Thanks so much for this recipe. I added some cayenne, extra lemon juice and about 1 tbsp of Dijon mustard. Yum! I couldn’t wait to dip a chip in it. Thank you! I’m an omnivore living with a strict vegetarian. I love me some vegan food, but hate meat and dairy alternatives. This cashew cheese is not cheesy at all in my opinion, but it’s SO GOOD. It’s hummus-like in texture, and rich but modest taste. Great on chick peas. Thanks for the recipe! I have never done it, will try very soon it seems delicious, and all the comments are very encouraging. Nutritional yeast adds a “cheesy,” savory flavor! Can you freeze it after it’s been made? How long will it last in the fridge? You sure can! And it’ll last up to 6-8 weeks. This has been my go to cheese for the past couple years now :). Can this be made with roasted cashews or just raw? I think raw is preferable, but I’ve used roasted in a pinch. It will taste a little roasted, but it’ll still have a nice creamy texture! Gena, What a great idea! Love this. I’m sure this is incredibly delicious!